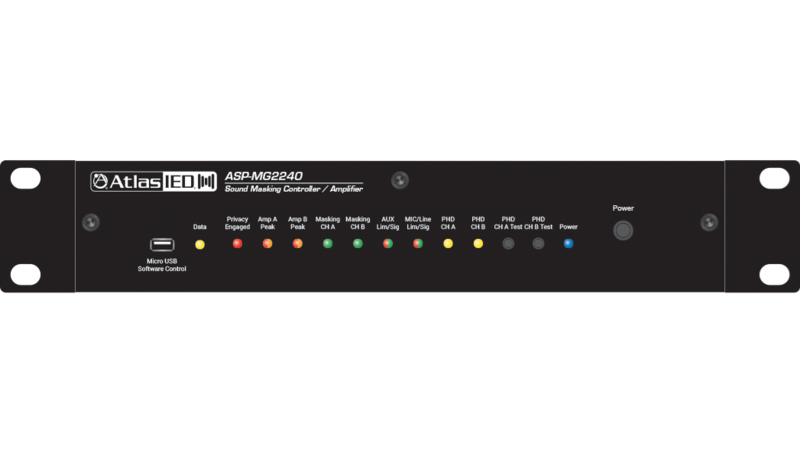 The AtlasIED ASP-MG2240 is a two-zone sound masking controller with integrated amplification. 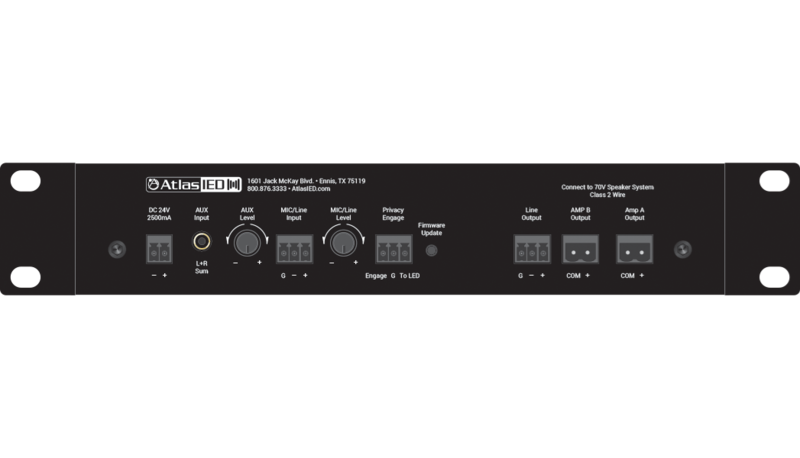 This compact device incorporates many useful features including two-channels of amplification, separate analog masking generators with EQ, 24/7 scheduler, balanced Mic/line input, auxiliary input for background audio and a line output. The PC control software allows the user to customize the system to meet installation needs. Settings can be stored in the unit or in the PC for file back up or recall. 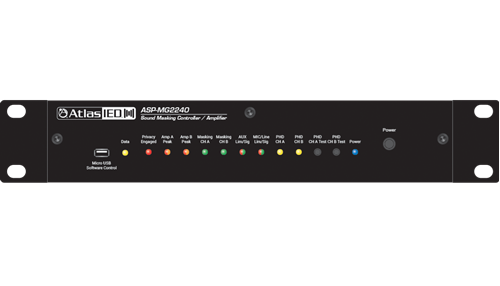 The ASP-MG2240 offers industry leading preconfigured presets that are tailor made for many common and advanced sound masking applications. These settings are based on proprietary Chanaud Masking Filters. Precise sound masking is now quick to implement. The compact ASP-MG2240 can deliver quality audio in a single masking zone up to 7000-ft2 or can be spilt into two 3500-ft2 zones. This compact, integrated solution features two internal 20-watt 70.7V amplifier channels along with internal DSP with intuitive control software. This software makes setup fast because of the reql world preset configurations that can be selected and modified for customization. 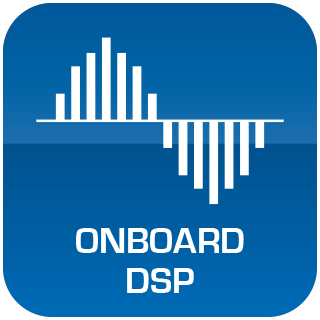 Speech Privacy Enhancement for conference rooms or medical offices is now simple to do allowing federal HIPPA standards to be met. 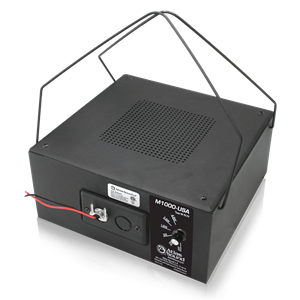 The ASP-MG2240 features a customizable speech privacy solution for any environment. When in a private meeting that requires speech privacy, simply press a switch to activate the Speech Privacy Enhancement mode. A visual aid to indicate when the room is secure for speech privacy is if needed. 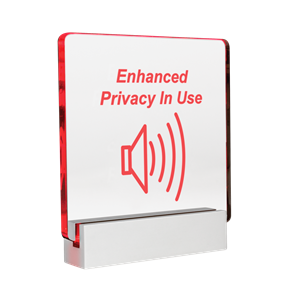 A variety of optional Speech Privacy Enhancement signs are available to connect to the ASP-MG2240. The ASP-MG2240 is an all-in-one solution that is effective in most applications. The ASP-MG2240 not only supplies speech privacy but also can deliver paging and background audio. Mic/line and auxiliary inputs each have a selectable 5-band EQ and Hi & Lo pass filters. For paging applications, the ASP-MG2240 incorporates a unique hi Q feedback filter specifically tailored to the vocal frequency range. Adjustable output limiters are in the audio chain to protect against system overdrive. Finally, the ASP-MG2240 includes a patent pending automatic diagnostic system test, called the Push Here Diagnostic (PHD). The PHD button is designed to check the connected speaker lines for wiring and amplifier load errors. 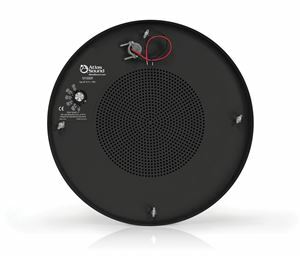 This test can be activated once all speakers are connected and the circuit automatically verifies that the attached speakers' tap settings do not exceed the amplifier's rated power and the speaker wire is free from shorts.